How To Update Your Team Affiliation – Team Monster Truck p/b Hub Bicycle Co.
Log in to your USA Cycling account. Click “Licenses” in the menu below the welcome message. Select “Update Clubs” and then click next. 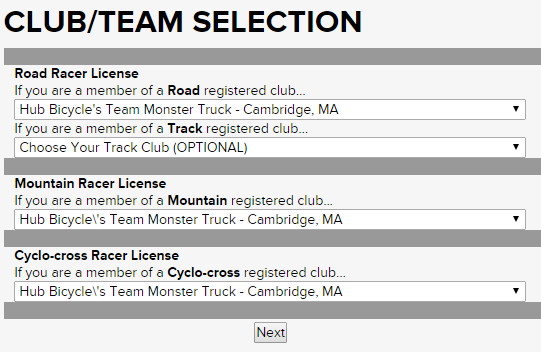 Select “Hub Bicycle’s Team Monster Truck – Cambridge, MA” for each type of license that applies, then click next. If you haven’t switched to a green license yet, click “Change your status now” at the top before checking out. That way, you won’t have to pay the re-issue fee. Once you complete the checkout, your team will be updated! Log in to your bikereg.com profile and click “MY BIKEREG” in the top menu.